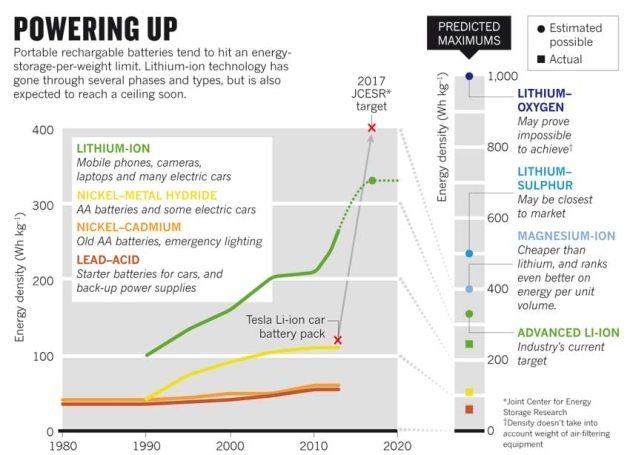 Nature’s article about the rechargeable revolution. USA | The US Joint Center for Energy Storage Research (JCESR) won a 150 M$ grant from the Department of Energy (DOE) targeting the research for batteries 5x denser in energy per kg and 5x cheaper than the current Li-ion batteries. And this by 2017. They must be sure that in the storage tech the rush for efficiency is all a matter of testing, which is the costly side of research. There are different storage technologies potentially suited to meet the target, but history tells us that not necessarily the early birds are the more successful. More money in the research would bring in more trials and more competition from around the world for what would be one of the biggest disruption in technology of the next years. To the benfit of the distributed generation and the off-grid systems. Read the interesting full article from Nature >>here. Next Post: How Microgrids are shaping their future. Right now.